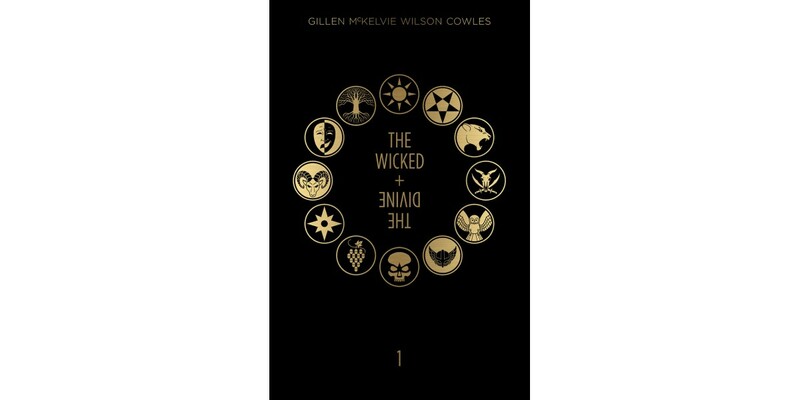 The New York Times bestselling hit series THE WICKED + THE DIVINE by writer Kieron Gillen, artist Jamie McKelvie, and colorist Matthew Wilson will be collected into a stunning deluxe hardcover edition, with must-have bonus material and extensive commentary, available this April. "I have always had three grand ambitions. To go into Orbit. To fly through the air powered by my own strength. To have a fancy hardback of my comic book series," said Gillen. "Now one of my goals is complete. I am so proud." THE WICKED + THE DIVINE is the Eisner-nominated, critically-acclaimed modern fantasy where gods art the ultimate pop stars and pop stars are the ultimate gods. THE WICKED + THE DIVINE Deluxe Hardcover (ISBN: 978-1-63215-728-7) collects the first two story arcs of the series—issues #1-11, plus commentary and bonus content—and hits comic book stores on Wednesday, April 6th and bookstores on Tuesday, April 12th. It will be available for $44.99. It can be ordered by retailers from Diamond Book Distributors with Diamond code FEB160652. It can be preordered now on Amazon, Barnes & Noble, IndieBound, and Indigo.